In November 2015, the endearing characters and captivating music of the animated film “Tangled” will enchant audiences once again, this time as an original stage show spectacular at sea aboard the Disney Magic – the first time the beloved Disney tale has been adapted for the stage. “Tangled: The Musical” will immerse you in Rapunzel’s fairy tale world through lavish production numbers and spellbinding music. Three new songs created exclusively for this show by Academy Award-winning composer Alan Menken and Grammy Award-winning lyricist Glenn Slater will bring the story to life onstage. Featuring elaborate costumes, groundbreaking puppetry and stunning set designs, the show will stay true to the storyline from the hit film – with a few special twists to create a live staged production. “Tangled: The Musical” complements the line-up of Disney Cruise Line-exclusive live entertainment performed every voyage aboard the Disney Magic, joining “Twice Charmed: An Original Twist on the Cinderella Story” and “Disney Dreams… An Enchanted Classic,” which will feature a new segment from the blockbuster animated hit “Frozen” beginning in summer 2015. 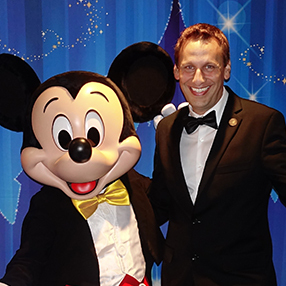 The new show will premiere during the Nov. 11, 2015 four-night Bahamian sailing aboard the Disney Magic, which will sail four-night Bahamas and five-night Western Caribbean cruises from Miami beginning Sept. 30, 2015 through the new year. Thanks for visiting my blog! For those that don’t know me, I’m currently a freelance writer / researcher, but my Disney career began in 1988, working for Disney TV Animation first on “DuckTales” and then as asst. producer of Disney’s “TaleSpin.” Over the years I’ve done everything from writing articles about Disney history for their official website to Disney photography. If you still really want to know more, you can visit my SCOTT’S BIO page. Let me know what you think if you like what I’m sharing on this site! Thanks for visiting!